@photobix I'm not seeing it on my 250c. What kind of coil/wire are you using? @photobix It might be a firmware issue or something else. Are you up to date in EScribe and with your mod? I'm testing now and it works perfectly for me on version 1.1 SP33 INT (for the 75c) and 1.1 SP35 INT (for the 250c). You can check the firmware in the About page in the theme. Also what kind of coil are you using? @photobix hmm interesting. I'll take a look tonight and push put a new update if I can figure out the issue. Thanks for letting me know! 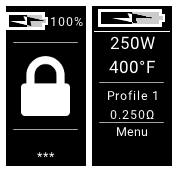 Just made a new update to fix the main screen when in wattage mode. Thanks! I haven't made many updates in a while since I'm pretty happy with the theme as it is. But I'm always open to suggestions/requests. Enjoy! Happy to help! Im going to rename that menu to "Main screen" so it's more clear what it does. @Korwin there is an option to show/hide which data you want displayed on the main screen. Go to Menu > Main config and there is an option to show or hide ohms on the main screen. That should do it. It's all good.. I'm happy to know one way or the other. Now I just gotta adjust the theme so that stuff is hidden when you can't adjust it. @Amon So I just did a bunch of testing on both my devices (75c and 250c) and wasn't able to replicate your problem. I have a replay profile with SS and was able to enable preheat and adjust the wattage and everything through the theme. Are you up to date with the latest International EScribe and device firmware? In Escribe, go to the Help menu > About Escribe and you can find your version there. I use the latest: 2.0 SP15.1. For your device, you can find it in the theme Menu > About. I'm using the latest Firmware: 1.1 / Service Pack: 33 / International (it may or may not say "INT" depending on if you are using the latest version of my theme, but there should be at least two numbers). If you aren't using the latest versions, be sure to update them. You can get the EScribe here and when you plug your device into EScribe if you don't have the latest firmware it will ask if you want to update (you should). If it's not a version thing, I'm not sure what else it could be. I haven't had reports of anyone else having the same problem. @Amon Glad you like it. It might be due to your profile? I honestly don't use preheat so I don't know much about the inner workings, but if I enable preheat in the menu on my device I'm able to adjust wattage and temp. 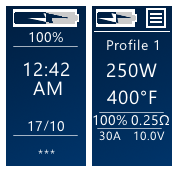 Looking at escribe, it seems you can only adjust preheat wattage with TC materials (not watt mode), in wattage mode all you can change is punch. In fact the theme is set up to hide the preheat wattage if it's not available. Is it showing up on the Preheat page and you can't change it, or is it just not there? 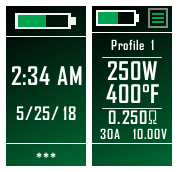 Mind telling me what device (75/250) and what your profile is like (TC/watt/coil material)? I definitely want to get this fixed if there's a bug. @mikesoimtold just added a ONE WATT version of the blue theme if you are still interested. @photobix thanks for the help, I ended up adding an official 1w version thanks to your suggestions. Anyone else, feel free to requests colors if you want a 1w version that isn't blue (can't do them all.. but I can make a couple.. there's already a lot of versions to keep track of). Oh ok I see. Now that I've got a few requests for it, I'll probably release a 1w version of the theme going forward. Keep an eye out for that, since I'm continually updating and improving the theme. I'll probably do it for the Blue version of the theme, unless anyone has objections. That's the most popular one by far. I wrote out instructions for that a couple posts up. And would be happy to make a one watt version for anyone who wants one But seems like you're sorted out. Enjoy! Right firmware and everything? TC enabled coil? Profile and theme with Replay enabled? Well if you keep having trouble let me know, I can easily package up a custom release for you if you tell me which color you want. Just didn't want to change the main theme since the 5w seems to be the most popular choice. Ah it's tough.. everyone wants something different. Most people these days use either high wattage or TC (me included), so I never need like 42w, because 45w is close enough. I think 5w increment is a good medium.. unless you are vaping under 20w, there isn't really a need for smaller increments. And for me, 45 is a "straighter" number than 44 I'd recommend you can edit this very easily in the theme when you download it, before installing it just click Edit > Screens > Main Screen > click on the Watts on the main screen > click Options button on the right > change Step size. The options are 1, 2, 5, or 10.